Where command is the Linux command man page you want to print/view. From there, open up command.txt in your favorite gui text editor (gedit, kate) and you have a readable format that could be printed quite easily for reference. Have you ever been using your Linux distro and suddenly found a program won’t close? It’s frustrating when an application hangs. In Windows, one could right click on the taskbar and choose “Task Manager” and kill the hanging process (which doesn’t always work BTW). In Linux, you can also kill these hanging processes. First, if you’re using KDE press Control-Escape. This will give all processes in a handy window called the KDE System Guard. Clicking the column heading for “System %” so the arrow on it appears facing up will sort the processes from highest system percentage to lowest. Find the process that seems to be hogging up all the resources (or if you know the name of the process, highlight that) and then hit the kill button. Your process should end it’s routines and exit. 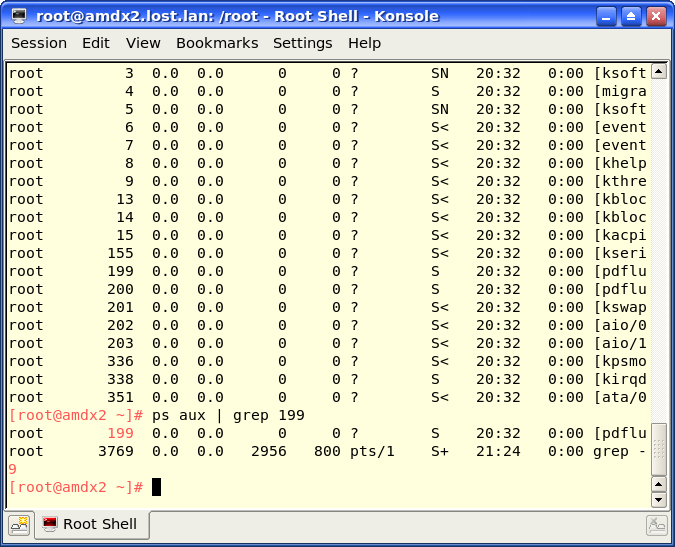 You can also check out which program is hogging up your virtual memory with its process which can also slow things up. Clicking on the column “VmSize” and sorting largest to smallest will allow you to see this and select which process to kill. I often elect to select only user processes using the drop down menu at the top right hand corner of the KDE System Guard. Doing this filters out all system files and shows any hanging applications that are initiated by the user (which is often what is hanging for me). Don’t worry if you see the same process more than once (for example, Apache or php may have multiple entries if you run a webserver…this is normal). If you’re using Gnome, you’ll either have to use the console method I explain below or launch the Gnome System Manager to get things rolling. Since I don’t use Gnome, I won’t cover the Gnome System Manager here. Another way you can do things…especially if all Xwindows (KDE, Gnome, Fluxbox, etc) have frozen or are sluggish is to drop to a console. You can do this by killing the Xserver or by dropping to a console. You can press Alt-F2 or Alt-F3 and get directly to a console. Login as root. Now let’s take a look and see what processes are hogging up resources. Kill the Xserver and drop to a console by hitting Control-Alt-Backspace. For our purposes, I’ll assume you’ve made it to the console now. Where PID is the process ID number you made a note of before. You may not get confirmation that the task has been immediately killed so let’s see if it is still running. We may not get the information we need by using top again since it is mainly for finding the higher consuming processes aka runaways. Instead, let’s use the ps command. Where PID is once again the PID you killed. The grep command will search through the results and echo back to you any matching entries it finds. If you didn’t find anything and couldn’t match your PID to that of any displayed in your ps aux command, you just successfully killed that beastly process. As always, for more information, please see the man pages (e.g. man ps or man top). Hopefully, this allows you to more efficiently manage your processes…runaway or normal. If I’ve printed an error, please let me know via the comments below or if there is a more efficient way of doing things let me know there as well…I’m always open to improvement. UPDATE: Please checkout the comments section for a few more tips on killing processes! pkill -9 -f SomeProgram” Thanks Scott!